Major Roland Elphinstone Gordon MC (Royal Field Artillery) dies of wounds at home at age 25. He is a Scottish Rugby International earning 3 caps. Captain Charles Frederick Sandoe (Duke of Cornwall’s Light Infantry) is killed at age 20. His brother was killed in May 1917. Captain Tom Cecil Haydn Berry (Welsh Regiment) is killed at age 26. He is a scholar and exhibitioner at Exeter College, Oxford. 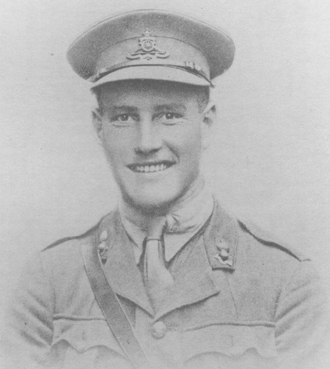 Lieutenant Edward Slattery DCM MM (Central Ontario Regiment) is killed at age 23. His brother was killed in August 1917. Lieutenant Roger Morrow Porter (East Ontario Regiment) is killed at age 20. He is the son of E Goss Porter KC MP. Second Lieutenant Harris Hartas Anson (Duke of Wellington’s Regiment) is killed in action at age 28. He is the son of Harris Anson JP. Sergeant Hugh James Frederick Barber (Australian Infantry) is killed at age 37. His brother was killed in November 1916. Lance Corporal Charles Pearson (Dragoon Guards) is killed at age 46. He is the last of three brothers who are killed in the Great War. Air Mechanic 1st Class Reginald William Cowin (Airship Construction Station, Kingsworth Royal Air Force) is accidentally killed flying at age 21. His brother was killed in July 1916. Private Ernest W Martin (Suffolk Regiment) is killed in action at age 19. His brother was killed in June 1915. Private Albert Martin (Northumberland Fusiliers) dies as a prisoner of war at age 19. His brother died of wounds in October 1917. Private Frederick Robert George Rockall (Royal Fusiliers) is killed in action at age 35. His brother was killed in September 1916. Private Percival Richard Bradford (Middlesex Regiment) dies of wounds as a prisoner of war at age 19. His brother died of wounds in 1914.